You can share video signals from your home theater’s video source devices throughout your house in four major ways. Sharing video in the home is more complicated than it once was, largely due to the advent of all sorts of signal encryption as well as the introduction of digital transmissions into the mix. As the price of video source devices (such as DVD players) plummets, many folks choose to purchase another video source device for remote locations in their home. You may, however, run into a situation in which you’d like to share some sources in your home theater with displays in other parts of the home. Most structured cabling systems (complete prepackaged home wiring products) include a centralized video-distribution system. This system differs from the standard cable company installations in one big way. Most cable installations use a branch and tree architecture, with the cable coming into your house from the street and then being fed into a series of splitters — little “one in, two out” devices that split a cable signal into two branches. A centralized video-distribution system uses a special splitter, called a video-distribution panel, that splits the incoming cable (or antenna) signal into multiple lines running to all your TVs — each a home run cable in a hub-and-spoke architecture. With a central video-distribution panel, you can create your own in-house television channels using modulators over your in-home coax cables. A modulator takes the composite or S-video output of a video source device (as well as the stereo analog audio outputs) and transforms it into an RF (radio frequency) signal — just like a television station does. You simply set the modulator to broadcast over an unused channel and connect it to your video-distribution panel. When you want to watch that source somewhere else in the house, you just need to tune your remote TV to that station. 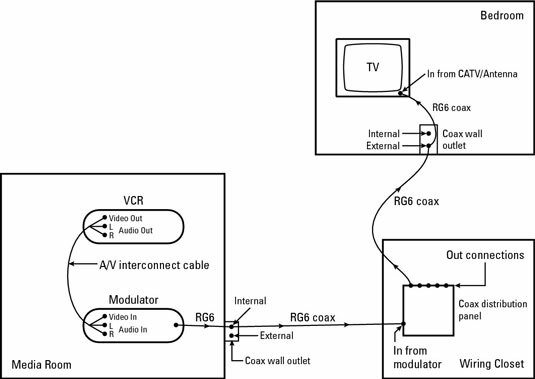 The following diagram shows a modulated signal (in this case, a VCR, but it can be any video source, such as a DVD player or a DSS satellite receiver). Modulator systems don’t work for everybody. New digital cable systems are designed to use all or most of the available spectrum on your home’s coax network, so carving out bandwidth for your piggyback data transmission is not so easy. In many instances, it’s almost impossible. You are likely better off pursuing nonmodulator alternatives.